By Evan Minsker, April 14, 2014 at 11:30 a.m.
As anybody well-versed in Miss Alex White and Francis White’s career knows, they put records out every year on April 20. That means that there’s always a new Record Store Day release from Chicago’s most famous redheaded siblings. The new one’s a double LP featuring a new studio album and a live album recorded at Chicago’s Double Door. 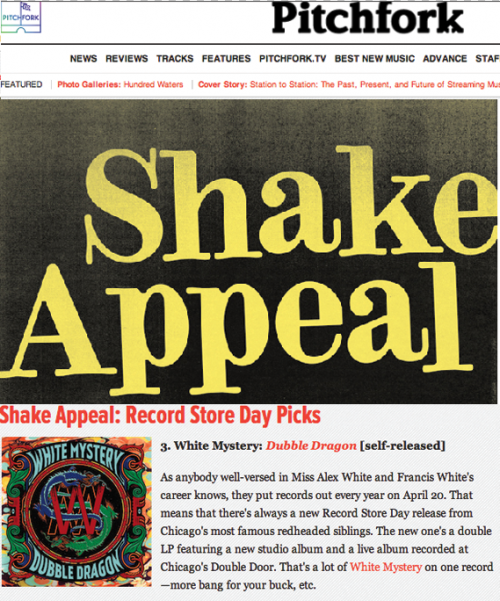 That’s a lot of White Mystery on one record—more bang for your buck, etc. CLICK HERE FOR THE FULL ARTICLE ON PITCHFORK.